Back in the late ‘90s, I did a lot of on-stage camera work. My company provided IMAG and archive video for music festivals, crusades and other events. I spent many hundreds of hours with a camera on my shoulder, dragging mulit-core or tri-x behind me. I typically required a grip because there was no way to quickly and safely navigate a stage—especially a festival stage—with a tether. We talked often of how nice it would be to go wireless. Back then, wireless was crazy-expensive and not so reliable. 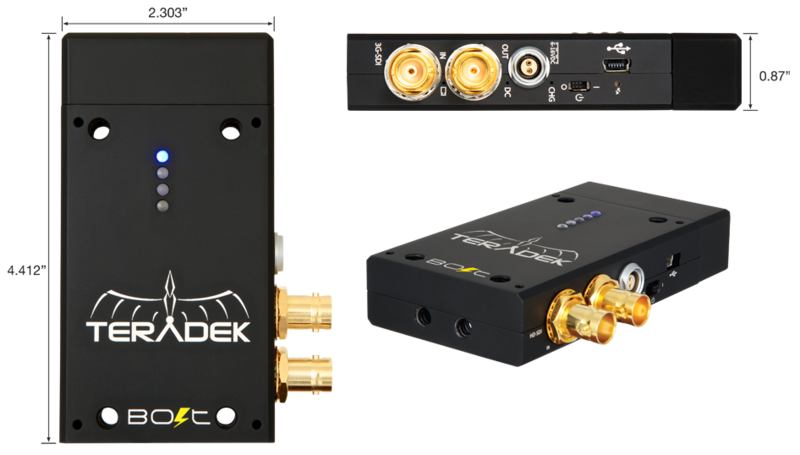 Fast forward to this summer when a friend of mine at Teradek contacted me and said they had a cool new wireless video option I should look at. Being about 20 minutes away, I drove up and took a lookey-loo. The Teradek Bolt is pretty unassuming. It’s a pair of black boxes with some gold-plated BNCs and a few blue LED lights. Throw in a Lemo and USB connector and that’s about it. Pretty simple. But what it does is anything but. It transmits video—any flavor up to 1080p—300’ (line of sight) with zero frame delay. Take a moment and read that again. 1080p, 300’, wirelessly, no delay. I may have sold a kidney for something like this 15 years ago. You can watch the video on their website which demonstrates the 0 frame delay. We tested it with dual outputs of the same camera, one wired, one via the Bolt and both were completely lined up. Set up could not be simpler, either. You plug your camera into the transmitter (HDMI and SDI input versions are available), and plug the receiver into the video system. Again, you can come out either HDMI or SDI. And here’s a cool thing: Let’s say you’re using a cheaper on-stage camera that only has HDMI out, but you need SDI in on your switcher. No problem. The Bolt will do the conversion for you. With no delay. We don’t do manned stage cameras at Coast, but I did run an entire weekend with our stationary drum camera running through the Bolt. It worked so flawlessly that my ATD Jon didn’t even know I had set it up that way. And set up is a breeze. There is no configuration, there are no menus. You plug it in, and in about 20 seconds, it’s working. The transmitter has a loop out connection on it so you can monitor locally, and the receiver has dual outputs for feeding two systems or inputs. They also make a multicast version that will take a single input source and broadcast it to multiple receivers (up to 4, and you can mix and match HDMI and SDI receivers). The Pro model features built-in LiOn batteries that will power the units for about an hour. They also have Lemo connectors so you can tap your AB or V-mount batteries, or use a Sony L or Panasonic camcorder battery. Receivers also come with wall warts. So if you’re like me, you’re immediately thinking; can I use this to send video to the kid’s wing or maybe the lobby and save the hassle of running cable? Well, maybe, but probably not. The Bolt is really not designed to be a long-range wireless video distribution system. It’s really designed for monitoring on a film set, but I think it would be perfect for a stage camera. I would put the receiver just off stage and wire back to the switcher. It operates in the 5 GHz band, so it won’t bother your wireless; I had it right next to our IEM transmitters and we had no issues. Best of all, it’s reasonably priced. In fact, it’s pretty remarkable how little it costs. Pricing is based on which transmitters and receivers you pair together, and starts at $1750 for an HDMI out system. Going to an SDI receiver adds $200, while upgrading to Pro adds $400. Personally, I’m shocked that for under $2000, we could send full broadcast quality video 300 feet. While it’s not for everyone, if you have a stage camera or two and are tired of them knocking band equipment over with cables, this might be the solution you’ve been dreaming about. Today's post is brought to you by DiGiCo. DiGiCo audio mixing consoles deliver solutions that provide extreme flexibility, are easy to use and have an expandable infrastructure, while still providing the best possible audio quality. Visit their website to learn more.